Flighted Standings for Individual League. Shows the event results and the handicap/opponent for next week. Good for individual leagues. Individual Average Point standings. Shows standings by average points and an itemization of points won for each event. Phone Directory. Three-column phone directory. Displays each player and their home phone number. Player’s round info. Show hole by hole what a player shot, gross, handicap, and net. Team Standing. Displays team standing and event results. Custom reports and custom views work the same. For simplicity “reports\views” will be referred to as only “reports” for the remainder of this documentation. You can design a report\view layout. Save it. And display a report\view using this layout at any time. To load, create, edit, or delete a custom report, pull down the Reports menu and select Custom Reports. A list of all report layouts you have created will appear. To view a report - Double-click the report layout or click the Use Report Layout button. To create a new report layout - Click the New Report Layout button. 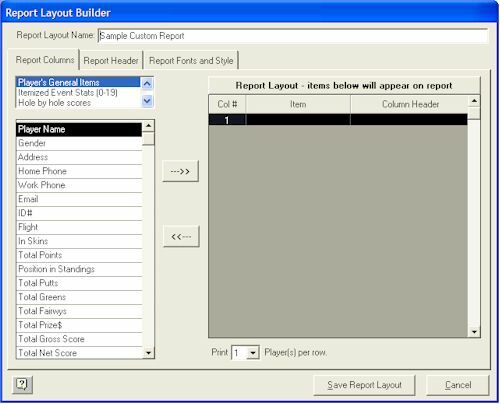 To edit a report layout - Click the Edit Report Layout button. To delete a report layout - Click the Delete Report Layout button. On the form you will notice two columns. The column on the left is the Items List, which contains items that can be placed on the report. The column on the right is the Report Layout, which shows items that will appear on the report. Items are listed in different categories so that you can quickly find them. At the very top of the Items List you will notice a drop down list box. This box contains the different categories available. Select the items category you wish to view. For example, the category currently selected in the above sample screen is “Player’s General Items”. See the table for the different categories and items you can place on player and team reports. Double click the item on the Items List (left side) and it will move to the right (on the Report Layout). You will notice when you add an item it is inserted on the column currently highlighted on the Report Layout. If you need to remove an item from the Report Layout, double click it to remove back to the Items List. 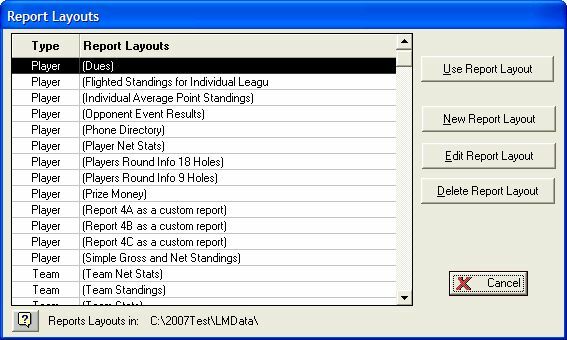 League Manager automatically inserts a “Column Header” for each item you place on a report layout. However, if you do not like the default, you can change this at any time. Simply edit the “Column Header” and type the text you wish to appear. <EVENT#> - Will insert the event number. For example, 9. <EVENTDATE> - Will insert the event date. For example, 06/01/00. <L> instructs the software to move further text to the next line. <EVENT#> instructs the software to insert the current event’s number. The box under the Report Layout List, “Print X players\Teams per row”, lets you indicate how many players/teams you want to display per row. The default is one and usually you will only want to display one player or team per row. However you may show up to three players or teams per row. 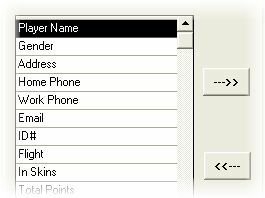 An example may be if you want a simple telephone directory with just the player’s name and phone number. You may wish to display 2 or 3 players per row to save paper, and the width of the report would not be too wide to accommodate this.